Privat basseng, fantastiske dekk. Komfortable og rolige. Bad 1 og 2 er ensuite. Den tredje badet er vegg i vegg med soverommet tre. We’ve just returned from one of the best holidays! The whole experience has been excellent. Sarah and Simon the owners have been incredibly helpful helping us plan our holiday. From the moment we arrived we were looked after by being met at the airport and treated to a wonderful home cooked meal after our long flight. The house was clean and homely with all the prefect touches. Tree Tops is in a great location close to one of the best beaches and close to stunning restaurants and Caribbean bars. Being tucked slightly off the main road makes it a wonderful experience to have so much wildlife in the garden to enjoy whilst sitting round the pool and having a BBQ. We look forward to returning back to Tree Tops next year! TreeTops is in a secluded location but only a few minutes to the best beach. The house is very comfortable and well arranged. The garden and pool are gorgeous. Rum punch and meals on the terrace are heavenly. Having a car is preferable but not essential. 8 adults enjoyed the space (2 of us had the new bedroom in the garden) and all agreed we would go back in a heartbeat. As always, thank you Simon and Sarah for letting us have your perfect house. The place is exactly as the picture depicts, its also in a cul-de-sac which means hardly any cars pass through leaving the space peaceful and quiet. The pool is warm all day/night long we even went in it about 10pm one night. The only minor issues we had were some technical issues with the TV, the microwave and one of the AC units in the master bedroom but we didn't call the workers as we were only there for a weekend but when we told them about it they were ready to come fix the problems. Overall is was a great get away weekend and we would definitely do it again! Our family of five stayed at Treetops at the end of August 2018. 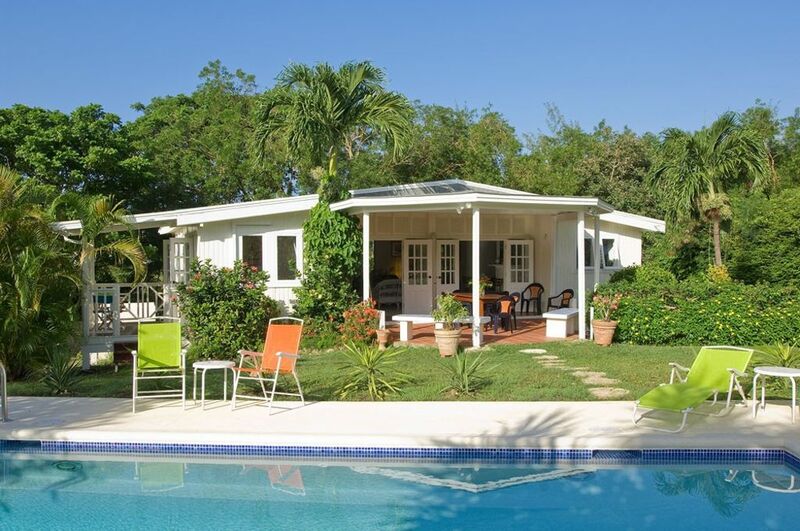 What a wonderful house, secluded, quiet, yet close to Mullins Beach. The visiting monkeys are always entertaining, the swimming pool is 8.0m long which is good for swimming as well as cooling, Andrew and Kailine are just wonderful. The whole experience was fantastic - I would not hesitate to recommend Treetops. We stayed at Tree Tops for a month in the early Spring of 2018. There were 6 adults. The property is delightful. We loved the back deck which is very private with comfortable places to sit and work. The wide, shady front veranda serves as a dining room and all around great place to be as well. The kitchen is well stocked, the beds are very comfortable and the living room is nicely decorated with bright couches and chairs. The whole house has a warm, holiday feel but we also felt at home as if it was ours. The pool is a huge bonus (well maintained) and towered over by a magnificent Traveling Palm. We thoroughly enjoyed all the birds and the family of monkeys that made its way daily around the perimeter of the property. We had very minor things go wrong while we were there (a light bulb too high to reach, a broken lounge chair) and these were immediately taken care of by the great staff. There are two beaches within easy walking distance. We did not rent a car but used the buses to go up and down the coast from the Fish Pot restaurant to Bridgetown. Usually we made a daily trip into Speightstown for a coffee, shopping or dinner. It was hard to leave Tree Tops and we would certainly go back! We loved our stay at Tree Tops, watching the monkeys in the garden, having a lovely pool to ourselves and easy access to the buses which took us up and down the coast and the best beach ever at Gibbs. Tree Tops er en familie ferie 350 meter fra Mullins Beach i St. Peter på vestkysten av Barbados. Privat basseng, fredelige tropiske hager, vennlige personale gjør det til et perfekt sted å slappe av på ferie. Tretoppene er selvhushold, men vi har 4 lokale kokker som kan lage mat noen eller alle dine måltider hvis du ønsker det. Alle tre soverom har air condition og er svært komfortable. De tre badene er moderne med vakre fliser. Butikker, restauranter er i nærheten og byen Speightstown er litt over en kilometer mot nord. Andre aktiviteter: Spa, Nature Reserve, Harrisons Cave.